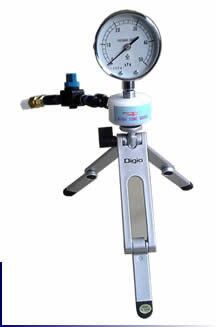 ‘HIGH TONE GAUGE’ is used to measure expiratory pressure. Breathe air into the tip of the tube of HIGH TONE GAUGE, and read the maximum pressure attained. When practicing wind instrument such as a trumpet, you can learn your latent ability how high tone you could blow up. The pressure is shown in the number of kPa unit. Lack of exercise or increasing age may lead to weakening of ability to breathe. HIGH TONE GAUGE will help you to prevent the weakning by showing your maximum expiratory pressure data as a result of your training being rightly done. (*1) reference: Please refer to the Home Page of Musical Instruments Shop, ‘M.Glory’ (President Kiyoshi Fujiwara). Tripod stand could be applied as that of digital camera. High accuracy and high response pressure gauge will show the movement of expiratory pressure in quick and correct motion of the indication needle. © KOBATA GAUGE MFG. CO., LTD.